This release contains a plethora of new features, widgets, bugfixes, and contributed plugin updates. There are no WordPress core updates in this release. It is immediately available for all ProudCity Hosted sites and for download on Github under the GNU Affero GPL v3 open source license. The menu selection box when you are editing pages has been greatly improved (see the before and after screenshots). We added a new Document embed widget, and the ability to display a submenu as a pill list. 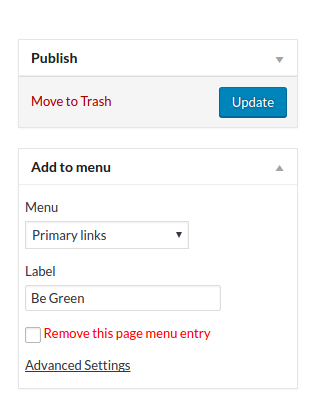 We also added support for custom 311 issue categories that embed an iframe, link to an external resource, or embed a Gravity Form. Contact ProudCity to set this up. See the full list of changes below. Release 1.16.0 will be another large feature and bugfix release with standard 3rd party updates. Version 1.16.0 will be released on October 4, 2016. Agency, Contact lists: Allow Social, Agency columns to be hidden #511 . There are no WordPress core updates in this release.